ORIGIN: Made with grapes Cabreo Estate vineyards located in the hills of Greve in Chianti at an altitude of 300 meters a.s.l. GRAPES: Sangiovese: 70%. Cabernet Sauvignon: 30%. Grape harvest: Sangiovese in the first half of October, Cabernet Sauvignon in the second half. Vinification: Tenute del Cabreo Cellar. Alcoholic fermentation: in stainless steel wine tanks at a controlled temperature of 28°C for both Sangiovese and Cabernet Sauvignon. Maceration on the lees: 15-18 days. Malolactic fermentation: stainless steel tanks at a controlled temperature of 22/23°C. Ageing: the two varieties are then blended and aged in French oak barrels (30% new, 40% one year old, 30% two years old) with decanting every three months for a total of 16 -18 months. Bottle ageing: minimum 6 months. Taste: aristocratic and velvety with hints of underwood, leather and raspberry. Serving temperature: 20 °C. Accompanies roasted meats, game and aged cheeses. "Doctorwine" has rated the wine "Tenute del Cabreo 'Cabreo Il Borgo' Toscana IGT, Tuscany, Italy" from the vintage 1988 on 15.01.2013 with 95 of 100 points.
" Orange. Perhaps because it aged in a jeroboam (double magnum) but it seems to have a long life ahead of it. There are still nice floral notes, pronounced whiffs of cacao and tobacco. The nose is broad, a spectrum of a thousand scents that chase each other, from cherry to tar, from ripe fruit to oriental spice. A machine-gun strafe of aromas, sandalwood, incense, face powder, green pepper, licorice, sweet spice. Laugh lines do not make one older only more seductive, the charm of maturity. The flavor is also great, balanced and long, bold and alluring. " "Doctorwine" has rated the wine "Tenute del Cabreo 'Cabreo Il Borgo' Toscana IGT, Tuscany, Italy" from the vintage 2001 on 15.01.2013 with 94 of 100 points.
" A full, garnet color. The aroma is a seductive array of scents. The bouquet opens with a nice fruit and violet floral notes. These are followed by balsamic accents of eucalyptus and spice, cinchona, tobacco and pepper in an enthusiastic progression highlighted by blood nuances, the common thread uniting all vintages. The aroma is 'rotund', sweeter than the others. The taste is very mineral, elegant the way flourishes. The tannins are creamy yet crunchy, full, which perfectly balances the acidity. " "Doctorwine" has rated the wine "Tenute del Cabreo 'Cabreo Il Borgo' Toscana IGT, Tuscany, Italy" from the vintage 1990 on 15.01.2013 with 92 of 100 points.
" A dark orange color. The aroma is very rusty, rust and blood. There are light nuances of honey, beeswax and evolved notes. The finish is a little salty with a ouch of tomato paste. The flavor has an evolved tannic taste, a slightly flat acidity, with a return of balsamic mint and licorice scents. This wine has already entered into its decline. " "Doctorwine" has rated the wine "Tenute del Cabreo 'Cabreo Il Borgo' Toscana IGT, Tuscany, Italy" from the vintage 1995 on 15.01.2013 with 91 of 100 points.
" Garnet with an orange edge. This seems younger than the 1997. The aroma is chameleon-like, expressionistic. Wilted rose, licorice, incense and ash, Mediterranean brush, humus and juniper berries. This is followed by dried leaves, balsamic notes and a vegetal veil of wild fennel. Elegant and poignant. The flavor is savory and mineral, with spicy and balsamic returns, still fruity. This is tasty and seductive, very good and with a long life. Here the Sangiovese has center stage. " "Doctorwine" has rated the wine "Tenute del Cabreo 'Cabreo Il Borgo' Toscana IGT, Tuscany, Italy" from the vintage 2006 on 15.01.2013 with 90 of 100 points.
" A transparent garnet color. The aroma is salty with vegetal nuances of aromatic herbs, especially thyme. It needs to breath in the glass before it can open and soften up. This allows in a touch of coffee to give chase to sweeter notes, mentholated ones, of pipe tobacco, almost sealing wax. The taste has an acidic streak that tears through rotund and wrapping tannins while in the aftertaste return fruity and balsamic scents. The only defect: a tad too much alcohol. " 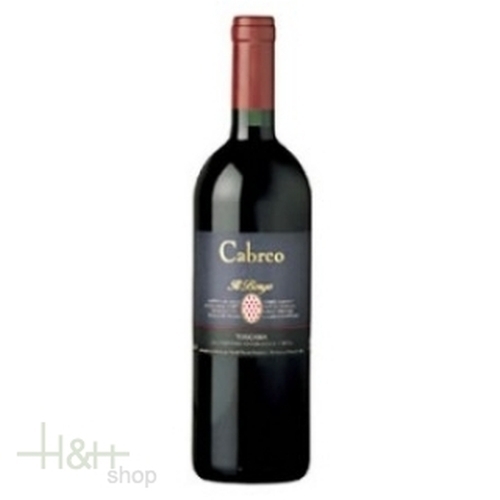 "Doctorwine" has rated the wine "Tenute del Cabreo 'Cabreo Il Borgo' Toscana IGT, Tuscany, Italy" from the vintage 1999 on 15.01.2013 with 88 of 100 points.
" Garnet. The opulent aroma overflows with ripe fruit, a potpourri of flowers, while balsamic notes hold in check the fruit and floral explosion. Then darker scents emerge, of underbrush and bark, slight vegetal notes and mushroom. The excellence of the bouquet, however, is not mirrored in the taste. The acidity is a bit biting, not well upheld by a body that is too thin. It closes with a slightly smoky note. " "Doctorwine" has rated the wine "Tenute del Cabreo 'Cabreo Il Borgo' Toscana IGT, Tuscany, Italy" from the vintage 1997 on 15.01.2013 with 88 of 100 points.
" Garnet with an orange edge. The nose is that of a deep breath in a forest of eucalyptus and pine trees. It is very balsamic and its ripe fruit is still present and blends in with the notes of cola, humus, dark cacao, face powder, dark tobacco, tea and oleander. While the bouquet was harmonious the flavor is less exciting because of its acidity, light body, evolved notes and a slightly warm finish. To be drunk now or never. " "Doctorwine" has rated the wine "Tenute del Cabreo 'Cabreo Il Borgo' Toscana IGT, Tuscany, Italy" from the vintage 2008 on 15.01.2013 with 84 of 100 points.
" The color is a compact and luminous ruby, while the nose has a fruity beginning with black cherry and blackberry and some slightly lactic notes. The bouquet then shifts darker tones of humus and earth, spice, slight whiffs of tobacco, ash and iron that chase distinct vegetal and balsamic nuances. The flavor is lively and savory. It enters with an energetic whiplash of acidity, perhaps too bold but sufficiently upheld by its extracts, a nice complexity. The tannins are elegant, not invasive, already delicate without any bitterness. " "Doctorwine" has rated the wine "Tenute del Cabreo 'Cabreo Il Borgo' Toscana IGT, Tuscany, Italy" from the vintage 1983 on 15.01.2013 with 83 of 100 points.
" Brick color. The aroma is of ash and smoke, dried flowers and balsamic nuances. To the taste there are still traces of the tannins as well as the remains of the acidity, even if dulled. It's a great 'old gentleman' who has already expressed all his rich personality but does not have the charm of the 1988. " "Decanter World Wine Awards" has rated the wine "Tenute del Cabreo 'Cabreo Il Borgo' Toscana IGT, Tuscany, Italy" from the vintage 2013 on 01.01.2017 with 84 of 100 points. "Wine Spectator" has rated the wine "Tenute del Cabreo 'Cabreo Il Borgo' Toscana IGT, Tuscany, Italy" from the vintage 2012 on 31.10.2015 with 92 of 100 points. "Wine Enthusiast" has rated the wine "Tenute del Cabreo 'Cabreo Il Borgo' Toscana IGT, Tuscany, Italy" from the vintage 2011 on 08.01.2015 with 89 of 100 points. "Wine Spectator" has rated the wine "Tenute del Cabreo 'Cabreo Il Borgo' Toscana IGT, Tuscany, Italy" from the vintage 2011 on 31.08.2014 with 90 of 100 points. "Wine & Spirits Magazine" has rated the wine "Tenute del Cabreo 'Cabreo Il Borgo' Toscana IGT, Tuscany, Italy" from the vintage 2010 on 01.04.2014 with 91 of 100 points. "Wine Spectator" has rated the wine "Tenute del Cabreo 'Cabreo Il Borgo' Toscana IGT, Tuscany, Italy" from the vintage 2010 on 15.10.2013 with 91 of 100 points. "Vinous Antonio Galloni" has rated the wine "Tenute del Cabreo 'Cabreo Il Borgo' Toscana IGT, Tuscany, Italy" from the vintage 2010 on 01.08.2013 with 93 of 100 points.